Along with communicating extensively via untethered mobile devices, Twitter users are more likely to consume news and information on these devices as well. For many Twitter users, learning about and sharing relevant and recent nuggets of information is a primary utility of the service. While Twitter users are just as likely as others to consume news on any given day, they are more likely to consume it on mobile devices and less likely to engage with news via more traditional outlets. 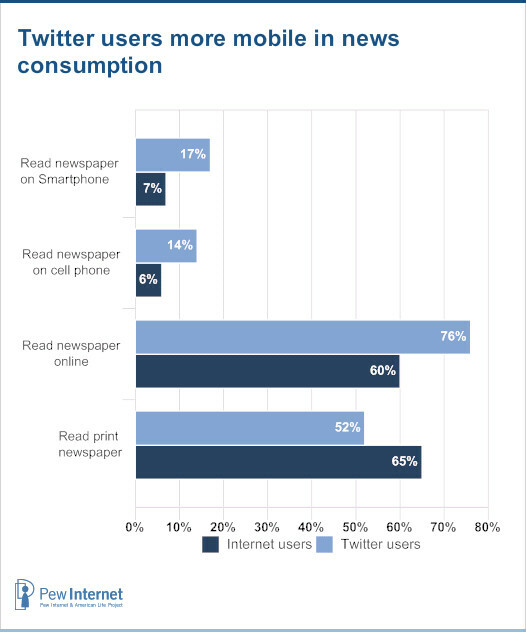 Twitterers are less likely to read a printed copy of a newspaper, but more likely to read a newspaper online, and more likely to read a news story on a cell phone or on a smart phone. A similar pattern holds for video news consumption; on any given day, Twitter users are just as likely as others to watch news on a TV, and just as likely to watch video news on a computer, but more likely to watch a news video on a cell phone or on a smart phone.